Location: Rancho Cucamonga, corner of Reales St. and Mojave Drive. From the east, take the 210 Freeway to Archibald. Turn right, go a mile and turn left on Wilson. Go 0.8 miles and turn right on Beryl. Go a mile and turn right on Reales St. and park where available (parking isn’t allowed on Mojave Drive). From the west, take the 210 Freeway to Carnelian. Turn left and go one mile to Wilson. Turn right and go 0.5 miles to Beryl. Turn left and go a mile to the Reales St. Turn right and park where available. 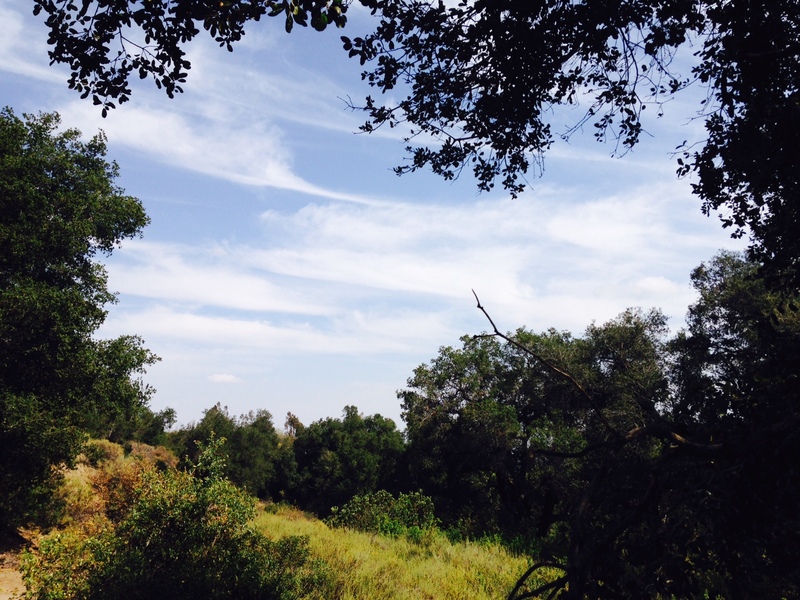 This hike consists of an unnamed City of Rancho Cucamonga bridle path and an unnamed service road which climbs to meet another unnamed fire road high in the eastern San Gabriel foothills. Despite the virtual absence of information online about these trails, they are in good condition, easy to follow and appear to get regular use from both foot and horse traffic. For the purposes of this post, the hike is referred to by the name of the cul-de-sac on which it starts. Various fire roads and use trails cross the area, making for multiple possible routes. 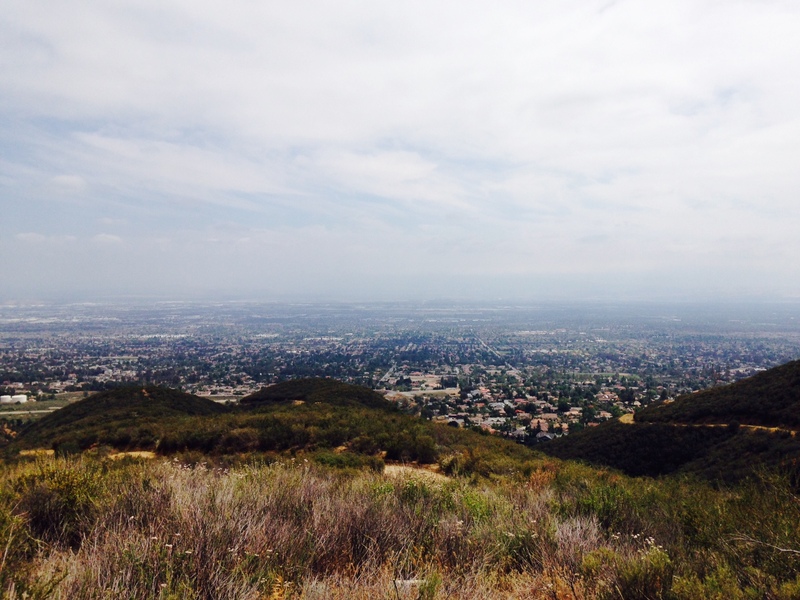 This post describes a 3-mile round trip that provides a good workout with panoramic views (pending good visibility) of the Inland Empire, conveniently located to Rancho Cucamonga and the neighboring communities. Follow Mojave Drive a few dozen yards to its end, where the bridle path begins. 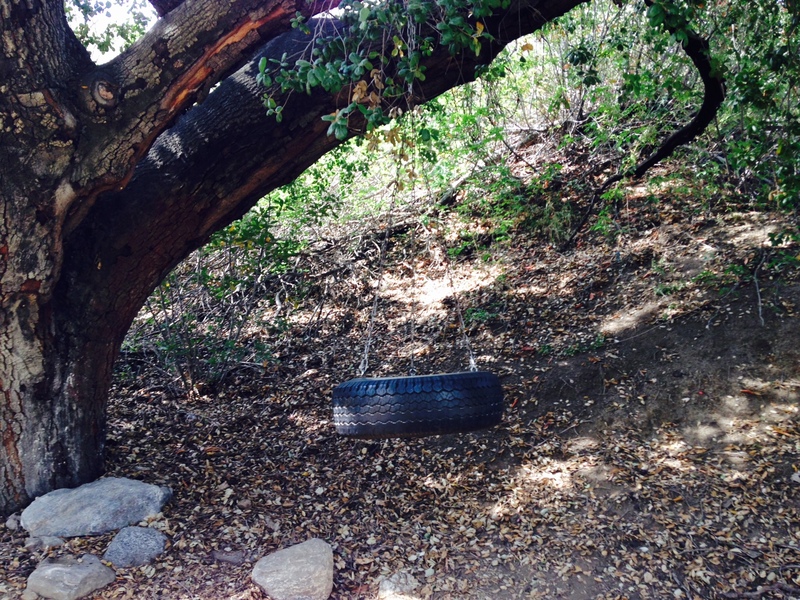 The path dips into a pleasantly wooded tributary of nearby Thorpe Canyon, passing a live oak with a tire swing hanging. Unfortunately, the shade doesn’t last for long as the trail begins its climb a quarter mile in. 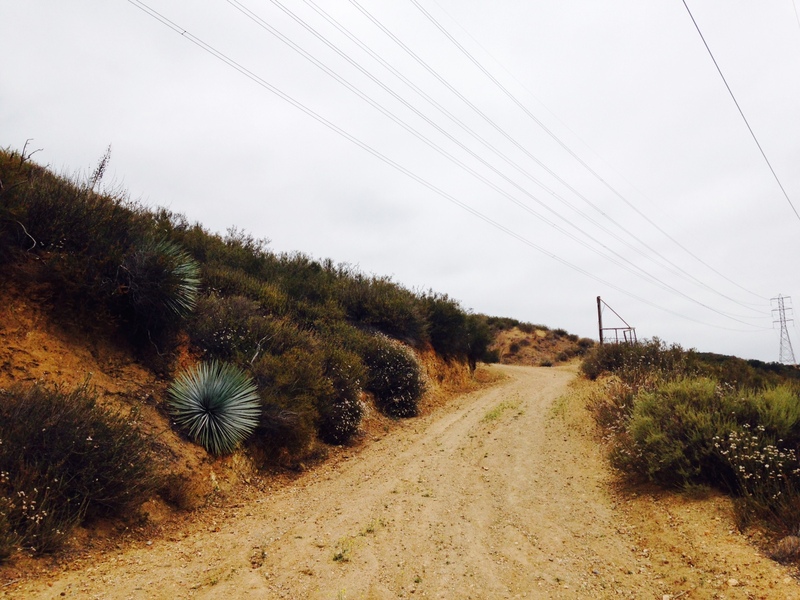 At half a mile, the bridle trail branches off to the right toward a private stable while the fire road, now signed as a Los Angeles County service road (despite the trail’s location in San Bernardino County) continues uphill and north. At 0.8 miles, stay right at an intersection, continuing the ascent. 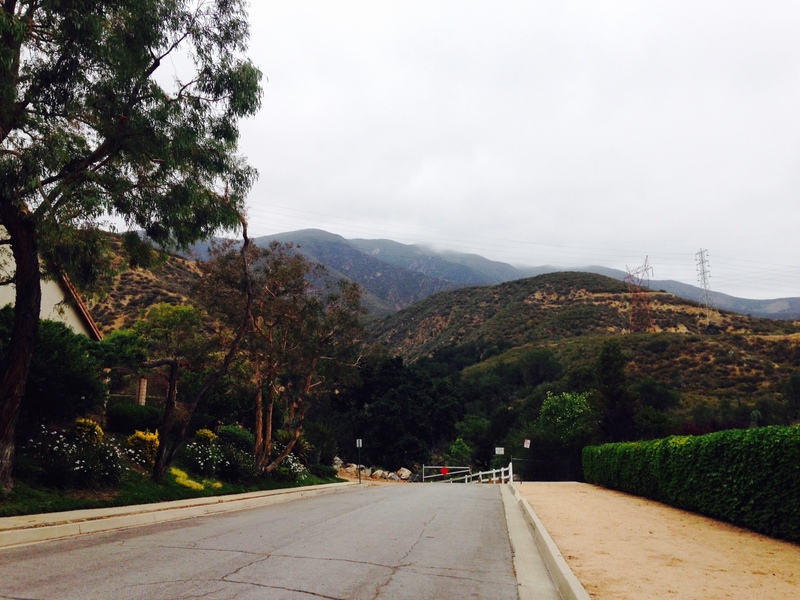 At a mile, you will have climbed above the power lines, enjoying unobstructed views of the Inland Empire to the south and the San Gabriel Mountains to the north. Just before the trail ends at a fire road that runs approximately parallel to the Cucamonga Truck Trail above, look for a clearing in which a 2×4 placed on two rocks creates what could generously be described as a bench. From here, you can take in the view before retracing your steps or continuing in either direction on the fire road. Another fire road also descends from this point, but judging from Google Maps aerial imagery, it appears to have a “land-locked” lower end at the base of a utility pole. 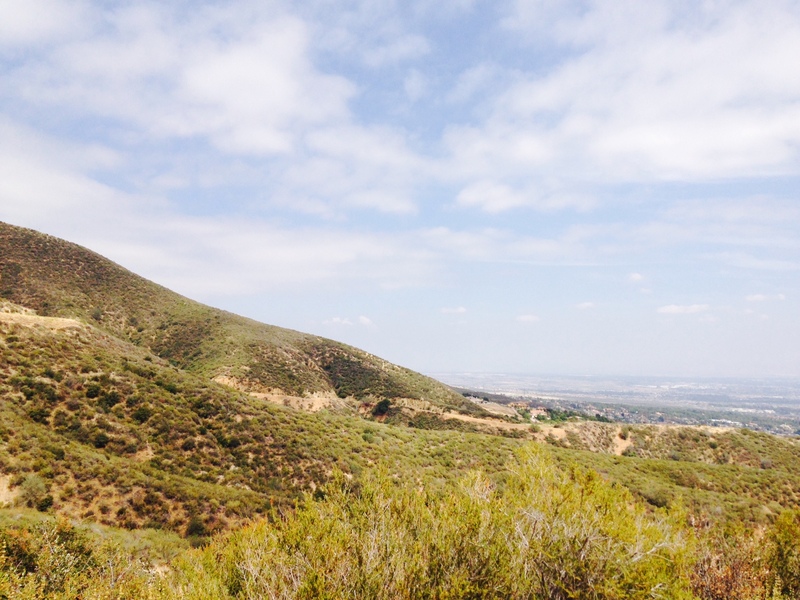 I went on this hike last Thursday when it was cloudy, and it is quite a scenic view of the Inland Empire for such a short walk! As you mentioned, the road that branches off to the left at the turn-around point does end at a utility pole. However, there is a small spur that descends on the right down through Angalls Canyon. It is in quite rough shape, being overgrown and quite steep, but not impossible. When you reach the west-end bridle trail, turn left and continue for a quarter mile until you finally reach the main trail you took on the way up. It’s a very large junction, where you would make a right. The trail on the right after coming out of Angalls Canyon (at the junction with the west bridle trail) is quite pretty and shaded as it follows a creek, but I believe is private property, as when I approached the end of the trail, I reached a locked gate (which I couldn’t pass) and the edge of Delphin Pl. It’s probably best just to retrace your steps like in your original post. Thanks for the hike! 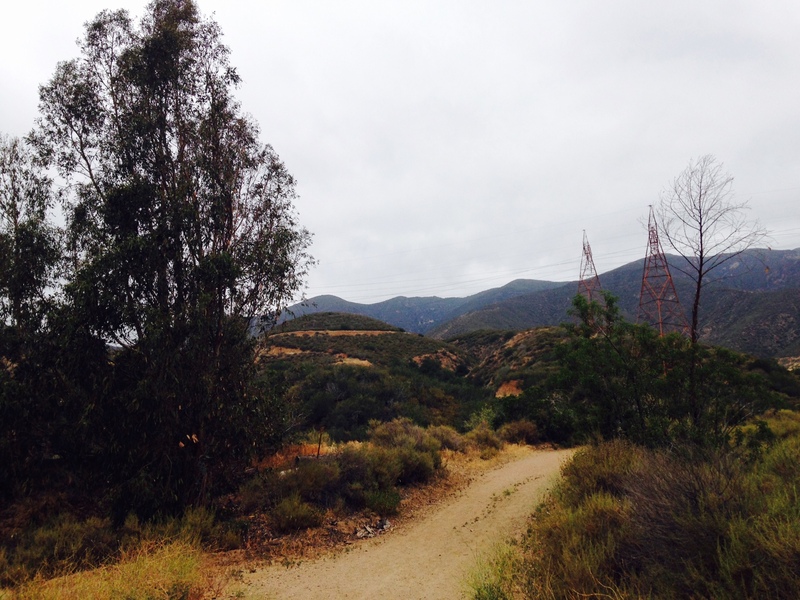 I’d love to see more hikes like this in the Rancho/Upland area!